Doctors initially thought Rachel Barezinsky would either die or live in a vegetative state after the Aug. 22 shooting. 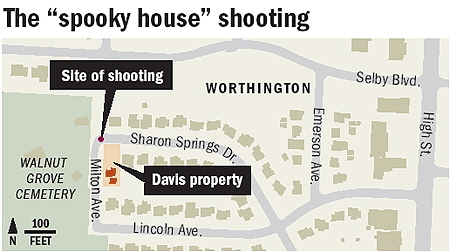 Worthington teens have long been attracted by spooky tales and the mysterious appearance of the Davis home, 141 Sharon Springs Dr. Allen S. Davis and his mother, Sondra, say they have been antagonized by unwanted visitors, including the five girls who came by for a scare Aug. 22. Rachel Barezinsky loved everything scary -- scary stories, scary movies and, best of all, scary houses. She had even made her friends brave her favorite -- the one on Walhalla Drive in Clintonville that they called the Amityville Horror house. Would an eerie blue light appear in the window like an apparition? Would the statue on the front lawn weep tears of blood? Would a wailing figure swathed in putrid, rotting bandages roam the halls? Rachel insisted they ring the doorbell to ask whether the house was really haunted. The woman who answered played along and told them a frightful ghost story. "Rachel was convinced the stories were true," said Brandi Karse, 17. "The scarier the stories were, the better." The girls decided they needed one last summer thrill Aug. 22, three days before the start of their senior year at Thomas Worthington High School. They talked about going swimming or seeing a movie, but they did those things all the time. There were parties, but they didn't want to drink. Then they remembered the "spooky house" just west of Walnut Grove Cemetery. The previous Halloween, the girls had driven by the house hidden by knotty old trees, shrubs and weeds. They instantly got the heebie-jeebies. "We got so worked up we thought we saw ghosts that weren't even there," said Kenzie Bruck, 18, who had cheered with Rachel on the Worthington Cardinals squad since their freshman year. "Rachel had convinced us the spirits were out, and it was exhilarating." Shortly before 10 p.m., Rachel and four other girls -- Tessa Acker, Rachel Breen, Margaret Hester and Una Hrnjak -- played rock, paper, scissors to determine who would drive to the spooky house, which faces Milton Avenue but has an address of 141 Sharon Springs Dr.
Tessa lost the game. So they all piled into her gold Saturn and began the short ride to the cemetery from Margaret's house, where they had been hanging out. Tessa drove slowly up Milton Avenue, past the cemetery's entrance and parked the car beside the home. Some of the girls thought it was deserted because of the tangle of trees, winding trails and generally untamed appearance. But others had heard it was owned by an old woman whom kids called a witch because of her gray hair and the large black caldron she used as a planter in the front yard. Rachel, Rachel Breen and Tessa climbed out of the car. Too afraid to venture far, the two Rachels stopped just past the stone columns of the gate. But Tessa, always one to push the limits, stepped a few feet farther for a better view. One of the girls saw an open window. Another thought she spotted a bat. All three held out their cell phones for light because the house and yard were pitch black. To make them jump, Una honked the horn. They ran back to the car, giggling and squealing. Awakened by the commotion, Allen S. Davis climbed out of bed and picked up his .22-caliber Marlin rifle. He had bought the rifle and a 20-gauge shotgun in 1994, after Worthington police stopped patrolling the cemetery, he said. He and his mother, Sondra Davis, who owns the house, no longer felt safe. "Allen didn't go out and buy a gun to go out and shoot people," his attorney, Brian J. Rigg, said at his trial. "He was scared. He was scared for himself and his mother." Davis, who has a bowl haircut, thick glasses and a frail frame, was taunted and teased his whole life. In grade school, he stood all alone in the same spot on the playground every recess, classmates said. As a teenager, he walked the mile to Thomas Worthington High School with his mother, who carried the family cat on her shoulder and walked their German shepherd at her side. By the time he was an adult, Davis and his mother had had repeated disputes with neighbors, police and city officials who wanted them to fix up their property. Now 41, Davis simply wanted to be left alone, in the relative peace and quiet of his home. But pranksters kept coming. Teens had tried to break into the house twice in the past few weeks, but "We drove them off," Davis told police. Kids also banged on the windows and doors, called him and his mother names and otherwise caused a ruckus. He had scared off people before by firing warning shots. So when he heard Rachel and her friends, Davis opened the window, leaned out with his rifle and squeezed the trigger as the girls drove off an estimated 65 to 70 feet away. He couldn't see them, but he could make out the taillights of the car in the street. Thinking they heard firecrackers, the girls circled back around. "It was such a rush," said Margaret, whom the girls call Hester. "It was like someone knew we wanted to be scared." They drove past the house a second time without stopping and again heard what they thought were firecrackers. A few seconds later, Rachel fell into Tessa's lap. The girls thought Rachel was joking until Una saw blood matting her long, blond hair. A crimson stain started to spread over her right shoulder. "Rachel was gasping and choking on blood, and we were crying, hyperventilating and screaming," Tessa said. "At this point, we thought she had been shot in the head and shoulder by a pellet gun." The girls in the back seat gently pulled Rachel up and hugged her from behind to keep her from slumping over again. Una called 911 from her cell phone while Tessa told Rachel everything was going to be OK.
"Oh, please, stay with us, Rachel," she pleaded and silently asked for God's help. Although the 911 dispatcher told them to stay where they were, the girls were worried that Rachel would bleed to death while they waited for an ambulance. So Tessa raced to High Street, blaring her horn. She figured they could drive to the fire station at High and Worthington-Galena Road. If they were lucky, they'd see a police car along the way. Una spotted one near the Graeter's ice-cream parlor. Tessa pulled her car in front of the cruiser and honked as they screamed for help. The Worthington police officer followed them into the parking lot and called for backup. Six other officers arrived within minutes. The girls could barely find the words to explain what had happened as they sobbed deep, shoulder-heaving cries. "We were freaked out," Tessa said. "It felt like forever before the paramedics arrived, and the police wouldn't touch Rachel even though she lay there in a deathlike state: convulsing, gasping, a pinkish foam oozing from her mouth. We were so angry, confused and frustrated." The girls didn't realize how close they had all come to being shot. In addition to the two bullets that hit Rachel, one entered the car through her window, went through the dashboard, ricocheted off the windshield and hit the driver's seat a few inches to the right of Tessa's shoulder. Rachel Breen showed police the Davis house as the other girls called family and friends. They were taken to the police station later and questioned for hours. Rachel's father, Greg Barezinsky, and stepmother, Drue, heard about the shooting from Drue's son, Joe. Joe, then 18, had driven to Graeter's after a friend had called him. After he confirmed that Rachel had been shot, he called his mom as he talked with police. In shock and unwilling to believe that his oldest daughter had been shot, Greg called Rachel's cell phone 20 times on the way to Ohio State University Medical Center. "I just knew the police were mistaken," he said later. "Who would shoot at a car full of girls?" He and Drue arrived at OSU Medical Center about 10:45 p.m. -- less than an hour after the girls had left on their adventure -- as the ambulance that had brought Rachel to the hospital was being cleaned out. "Just as I ran through the door of the emergency room, a nurse was telling Joe, 'You have to calm down,' " Drue Barezinsky said. "Joe was screaming, 'I have to see my sister!' "
wrapped in each other's arms with their heads bowed, pain etched on their faces. "I knew it wasn't going to be good," Drue said. Rachel's mother, Amy Barezinsky, was getting ready to go to bed when a police officer knocked on her door. "Your daughter has been in a car accident," he told her. "I looked into his blue eyes and asked, 'Is she dead?' 'Is she dead?' 'Is she dead?' " Amy said. "I must have asked him that same question five times." All he could say was, "I don't know, ma'am. Do you have someone to take you to the hospital?" Back at the hospital, a doctor pulled Greg, Drue and Joe into a private room to tell them that Rachel had been shot in the head and shoulder. 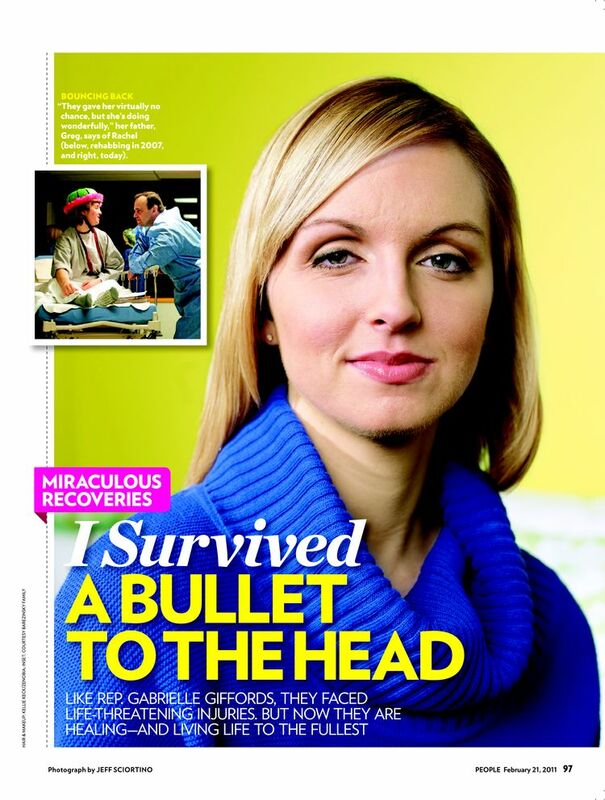 "The bullet crossed both sides of her brain. There's nothing we can do," he said. The doctor didn't want to tell the family, but he thought that Rachel would die before the end of the night or live out her life in a vegetative state. Losing hope, Greg fell against the wall as Joe dropped to the floor. Drue held both of them as Amy walked into the room. "Amy looked at them and their faces and was convinced Rachel really had died," Drue said. "I've never seen her so frantic." 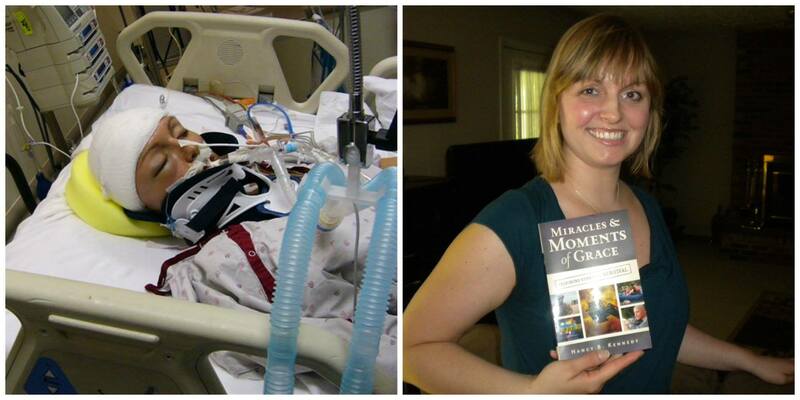 After learning the truth, Amy asked about Rachel's vital signs and blood pressure. As a former intensive-care nurse, she knew that, if both were strong, Rachel had a fighting chance. They were. They left the conference room, and Drue broke the news to the family and friends who had gathered. Tessa cried, "I'm so sorry. I'm so sorry. I never meant for any of this to happen." After saying a prayer, Greg called his priest from St. Michael Catholic Church in Worthington to perform the sacrament anointing of the sick, formerly known as "last rites." The Rev. Richard Pendolphi made the sign of the cross by dabbing oil just below the big bandage around Rachel's head and on her hands. "Through this holy anointing may the Lord in his love and mercy help you with the grace of the Holy Spirit," he said. Rachel was in a coma. Whirring machines filled her lungs with air and monitored her heartbeat as bags dangling from tall poles dripped medicine and blood into her body. "May the Lord who frees you from sin save you and raise you up," the priest said. The ritual renewed Greg's hopes. "I had felt like giving up. But if I don't have faith, what would I live for?" he said. As word spread about the shooting, hundreds of classmates, teachers and other community members spilled into the hospital. Rachel's relatives huddled in a small room and her closest friends gathered in a nearby waiting room, where they cried, hugged and shared stories about her thousand-kilowatt smile and vivacious personality. They talked about how they admired her determination, physical strength and strong faith. And they worried what they would do if she didn't pull through. Throughout the night, doctors checked to see if Rachel could respond to simple commands, such as squeezing her hand and wiggling her toes. She could do everything with her right hand and foot, but not her left. 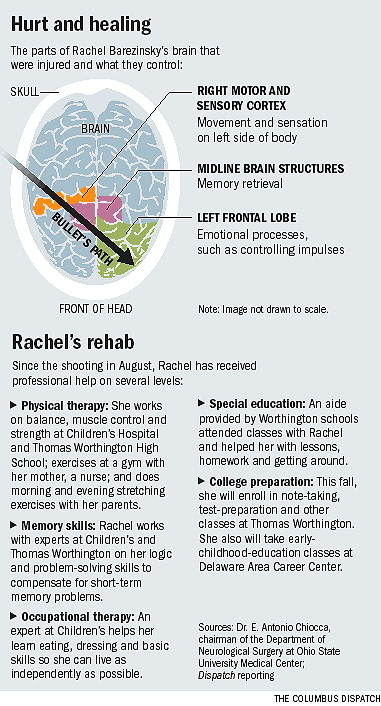 "We were still encouraged because we knew Rachel had some brain function," her father said. "The little things took on great importance." Sometime during the night, Thomas Worthington Principal Richard Littell was told that Rachel had been shot in the stomach. He notified teachers through a telephone tree and mobilized the school's crisis-management team to help students shaken up by the shooting. "The more well-known a student is, the larger the impact," Littell said. "Rachel had a lot of energy and spirit, and was involved in a whole lot of social activities." About 10:30 the next morning, doctors noticed that Rachel's brain had started to bleed and swell. They needed to operate immediately to reduce the pressure before it further damaged her brain, but Rachel's mother and father had gone to their homes to shower and try to nap. Her stepmother, who was still at the hospital, called both and told them to return as quickly as they could. It's a matter of life or death, Drue said. Two hours later, neurosurgeon Carole Miller cut into Rachel's newly shaved head and pulled back her scalp to reveal her skull. Using a half-inch drill, she burred several holes through the bone. Miller cut from one hole to the other, removed a triangle of skull about 4 inches on each side and handed it to a scrub nurse. Finishing up, Miller stitched the muscle and skin over the depression and placed a drain in Rachel's brain to remove any blood left over from the surgery. At 1 p.m., a half-hour after she made her first incision, Miller approached Rachel's family in the waiting room. "Everyone panicked when we saw her because we were told the operation would take two to three hours," Drue said. Instead, Miller said everything went well. "She told us Rachel was going to live," her father said. "Anything else she said, I didn't hear. All I cared about was that she was going to live. "I wanted to shout, 'Rachel is going to live! Rachel is going to live! Rachel is going to live!' "